This week's tablehopper: spring forward, fall down. 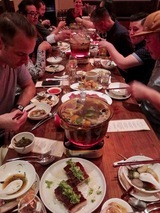 It was a luxe hot pot party at Mister Jiu’s for the return of The Family Meal. Photo: © tablehopper.com. Happy Pi Day. Which is why I decided it’s totally okay and actually a fabulous thing to be eating a slice of pizza for breakfast today (mmm, from Goat Hill Pizza, score). May the wonders hiding in my freezer never cease. Have a great week. Congrats to all the James Beard Award nominees announced today, from media to best bar program to best chef: west! Cheers! Now excuse me while I track down that CD. The vintage Parisian salon atmosphere at Bar Crenn. All photos: © tablehopper.com. The decadent deviled eggs with crab. 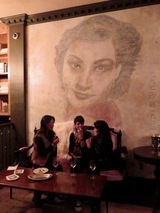 The fresco in one of the sitting areas at Bar Crenn. The showstopping pâté en croûte. 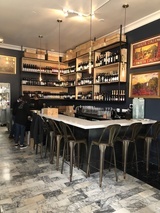 Those of you who follow me on social media already have seen a preview peek of Dominque Crenn’s latest jewel box, ~BAR CRENN~, which just opened in the former Cellar Door in Cow Hollow. Step inside (if you were lucky to score a reservation already, or perhaps you’re taking your chances and hoping to squeeze in some night) and it’s like a Parisian salon, or as a friend and I liked to think of it, a French consul’s New York apartment from another time. The light from the vintage chandeliers and wall fixtures is dim and creates an intimate atmosphere, while the chairs are loungy and take up a fair amount of room—it’s a luxury to sit back and have that much space around your table. The marble bar is flanked by stools covered in fuzzy wool, and there are bookshelves full of books, an array of antiques, and assorted objets that all contribute to a residential and cozy, lived-in feeling, along with a fresco on the wall. An array of global rugs throughout the space and heavy green-gray velvet curtains close off the outside world and help dampen the sound. Karan Brady is the designer behind this refined hideaway. The à la carte menu is an homage to classic French dishes and chefs, with their recipes dutifully followed by chef Jonathan Black, executive chef of Crenn Dining Group (Atelier Crenn, Petit Crenn, Bar Crenn). He says his team has really been having fun learning and working on the dishes. The menu includes the names of the chefs next to their dishes, from Guy Savoy’s ice-poached oysters tucked within two layers of gelée (oyster cream, Meyer lemon, New Zealand spinach), to Éric Fréchon’s oeufs mimosa au thon et au crabe, basically some of the fanciest and most flavorful deviled eggs you have ever tasted (especially the version with confit of tuna belly topped with cured tuna heart). The house pâté en croûte is a pièce de résistance, with pork shoulder and back fat and bacon lardons and Cognac and shallots and pistachios too. (The pastry is really a thing of beauty.) There are a couple of larger plates as well, including quenelles lyonnaise and pied de cochon. Just wait for the exquisite canelés de Bordeaux for dessert from Juan Contreras. Everything comes out on vintage china and you’ll see some silver too, adding to the elegant, old-world feeling. It’s food built for wine, and wine director Matt Montrose has you covered with quite the list, with a focus on organic, biodynamic, and environmentally responsible vignerons and domaines, primarily French and Californian. Take a look here. Yup, keep scrolling. You’ll also find some old-school French-style and low-proof aperitifs featuring vermouths and sherries, including the Partage (crème de cassis, amontillado sherry, sparkling wine, and bitters). Mark your calendar for March 20th, when the reservations for April open up, and on April 15th, for May (you can plan when to drink your tax woes away). Reservations are for parties of two to four, at varying price points and experiences, and there is a deposit. Parties of one, five, or six can call for availability. You can also try to sneak in, maybe late one night—they’ll accommodate however they can and are keeping half the room open for walk-ins. Hours for now are Tue-Sat 4:30pm-12am (last call for the kitchen at 11pm). 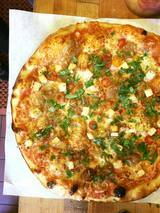 3131 Fillmore St. at Greenwich, 415-440-0460. The dining room and open kitchen at Dispensa Italian Charcoal Kitchen. All photos: © tablehopper.com. Grilled pork chop with potatoes and apple butter. Last week, I was invited to check out a friends-and-family dinner at the newly opened ~DISPENSA ITALIAN CHARCOAL KITCHEN~. If you would have told me I’d be having a dinner with table service and Italian wines at a restaurant on Taylor and Turk 10 years ago, I wouldn’t have believed it. Chef Michele Bevilacqua (a Venetian chef) partnered with Stu Gerry (previously an owner of Cafe Flore and currently a realtor at Zephyr Real Estate, he helped secure the location after quite the search); Tiziana Costamagna (Vinity Wine Company) is doing some consulting for them. It’s conveniently near the theaters, and they’re happy to offer something different for the neighborhood. It has a minimalist style, warmed up with wood tables (which Michele made by hand), modern chairs with wood dowel legs, and brick walls. The space is more than 100 years old, and Michele did a tremendous amount of work to reveal its amazing bone structure (including some beautiful wood beams)—it was previously a wedding cake bakery. The black-and-white photographs on the walls are by Tiziana. The main feature of this unique restaurant is in the open kitchen. There’s no oven, and no range, or grill, or fryer. 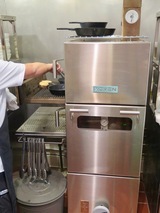 But there is an X-Oven, which is an eco-friendly oven from Italy, the first of its kind in the U.S. It burns green charcoal made from vegetable waste—there are three drawers on the side where cooks can slide in skillets to roast and cook everything. The majority of the smoke goes through the ventilation system (although you will note some smoke when you come into the space). It’s completely self-contained, with no gas or electricity. It’s a pretty amazing little unit, and the kitchen crew is ramping up their expertise in using it—it has a lot of potential uses and clever applications. 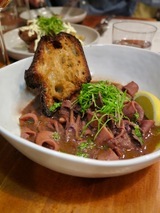 While the restaurant’s name is Italian for “pantry,” the menu is more Californian than Italian, and very simplistic in its flavors and presentations—well, except for the spicy calamari stew ($15), one of those classic ugly-but-so-good Italian dishes (it was one of our favorites). There’s also tender grilled octopus ($16) with a simple salad of frisée, Gaeta olives, and cherry tomatoes, and there are a variety of vegetable dishes, from rainbow carrots with goat cheese and sesame seeds ($14) to potatoes with lemonaise ($10)—all have a smoky kiss from the charcoal. There are also a couple of salads ($15) and three mains from the charcoal oven: pork belly ($20), roasted Mary’s chicken ($22), and a thick grilled pork chop ($25). The dishes also come with vegetable sides, so make sure they don’t duplicate what you may have ordered as an appetizer. Chef cares about his ingredient sourcing, but is also keeping things priced affordably for the neighborhood. The wine list is all-Italian, with 12 by the glass, ranging from $11-$19. There are also a couple of local beers and a Ninkasi Pacific Rain pale ale from Oregon. Open Tue-Sat 5pm-10:30pm. Lunch will be coming soon. 39 Taylor St. at Turk. Benvenuto to AltoVino! Photo courtesy of Sasha Bernstein. The front bar at AltoVino. Photo courtesy of Sasha Bernstein. The dining room at AltoVino. Photo courtesy of Sasha Bernstein. 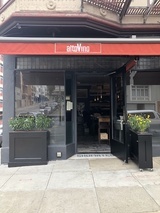 Last fall, I broke the news that Claudio Villani of Cole Valley’s InoVino was taking over the former Mason Pacific in Russian Hill and opening ~ALTOVINO~, and now it’s opening this Thursday March 15th. Villani, a Tuscan-born sommelier, previously worked at Incanto, Perbacco, and Quince, and is featuring lesser-known Italian alpine and volcanic wines (hence the “alto”), along with Tuscan and Piedmontese classics. Look for a big focus on nebbiolo, and there are also sparkling wines, some excellent pinot nero from Alto Adige, and plenty of sangiovese, from Chianti Classico to Brunello. You’ll discover many well-priced selections on the menu, along with some magnums and other large-format bottles too. There will be 30 wines by the glass, starting at $8. You’ll definitely want to find time to sit at the bar and have Villani talk to you about his wine selections—he’s very passionate and loves to educate. There will also be aperitivi, including two seasonal spritzes (right now there’s one with a housemade ginger shrub, white vermouth, prosecco, and tonic water) and a selection of three vermouths you can enjoy over ice. And now, the food! Villani met chef Nick Kelly while they were both working at Perbacco, and Kelly has been the chef at InoVino since January 2017. At AltoVino, he has assembled a menu of seasonal Italian dishes from regions that will rotate (think heartier Northern dishes for the winter, Tuscan dishes in spring, and Southern in the summer). Kelly has really been able to stretch his wings with the large pasta room they built out, and he is committed to a no-waste kitchen. You can come by for an aperitivo and stuzzichini (bar snacks), like grissini with speck, Gorgonzola Dolce, and pickled radicchio ($9), or assorted crostini ($8), or ascolane (fried olives filled with braised oxtail and Parmesan, $8). Larger antipasti include squid with braised winter greens, tomato, Calabrian chile, red wine, preserved Meyer lemon, fennel, and grilled bread ($14) or burrata with roasted red kuri squash, chicories, balsamico, and bread crumbs ($14). The menu (please note this is a draft!) of housemade pastas is extensive (just the spaghettoni and risotto aren’t housemade), from cavatelli with slow-roasted lamb ragù, preserved Meyer lemon, braised cavalo nero, olives, pecorino romano, and rosemary ($21) to cappelletti filled with roasted winter squash, amaretti, and fresh ricotta with candied hazelnuts, fried sage, and Parmigiano crema ($18). Mains (secondi) include lemon and ricotta polpette (pan-roasted pork meatballs, $18), sea bass roasted under a salt crust ($29), and a showstopping La Fiorentina, a 1-kilo dry-aged porterhouse steak with grilled Treviso, corona beans balsamico, gremolata, and roasted bone marrow ($79). The space got a nice refresh—the dining room has walls that are an inky indigo with panels of Italian fabric, and there’s a light tobacco-colored banquette that runs the length of the room. Outdoor tables with heatlamps will also offer quite the SF atmosphere as the cable car trundles by. Dinner is served Tue-Sun beginning at 5:30pm; the restaurant and wine bar open at 5pm for aperitivi and snacks, both in the bar and at sidewalk tables. 1358 Mason St. at Pacific. The famed “five guys” xiao long bao at Dragon Beaux. Photo: Russell Abraham Photography. This is pretty awesome news for folks who live near Ghirardelli Square, and the tourists don’t even know how lucky they are to have Daly City’s famed Koi Palace opening a new project in the former (and huge) Waxman’s space called ~PALETTE~. Scoop reports the project will actually be taking inspiration from Koi Palace’s sister restaurant in the city, Dragon Beaux, known for its colorful dim sum that is built for eating for the Insta (but actually tastes good, so eat it, okay?). In the evenings, the focus will turn to seafood and barbecue. Bring on the live fish in tanks. There will also be an outdoor service counter, potentially offering dim sum to go. The 6,500-square-foot restaurant has room for 200 seats, something the Koi Palace folks are not afraid of. But they are going to be doing some construction, including moving the bar area, so timing is TBD for now. 900 North Point St. at Larkin. A panoramic pic of the new Café Lambretta. Photos courtesy of John Quintos. 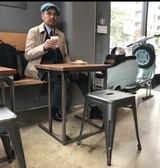 A stylin’ customer at Café Lambretta. Plenty of ephemera for the mods to love. 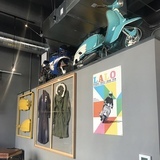 Café owner and Lambretta fanatic John Quintos has opened his latest and most ambitious location: ~CAFÉ LAMBRETTA~. I last wrote about it in 2016, so he has been working on it for some time. The SoMa café is a spacious 1,500 square feet in a circa 1913 building, with plenty of seating (both at tables and counters) and vintage Lambretta scooters and scooting ephemera throughout. Quintos even made an art piece: he took apart a Lambretta and made the parts look like one of those old-school plastic model kits. Quintos is also behind Cento café and the Cento Coffee roasting label, Special Xtra and Special Xtra 2 cafés, and more. You’ll have all kinds of espresso and coffee drinks to choose from. Bonus: there are also beers. And wine! There’s also a menu of salads and sandwiches, thanks to consulting chef Christian Ciscle (Wing Wings), from a chopped Greek or arugula salad (with pear, Marcona almonds, manchego, and sherry vinaigrette) to hot sandwiches (tuna melt or pastrami with Swiss and coleslaw) and cold ones too (chicken salad, or Black Forest ham with Fontina and arugula). If you just want a snack, there are also a variety of empanadas from El Porteño and house-baked goods like jalapeño cornbread and coconut-pineapple mochi. Also worth noting: no Wi-Fi. Hours for now are Mon-Fri 8am-4pm Starting April 2nd, hours will be 8am-8pm. 101 Townsend St. at 2nd St. 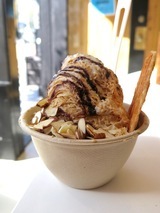 The Big Easy at Powder, with Vietnamese coffee snow, toasted almonds, chocolate sauce, and sweet milk glaze. Photo: © tablehopper.com. I received word from a tablehopper subscriber that the Inner Sunset’s ~WOOLY PIG CAFE~ was closing, and Eater shared the news that it’s actually relocating, but to Dogpatch. Sorry, Sunset residents. Dogpatch folks will soon learn to love the Wooly Pig sandwich (with Shanghai-style braised caramel pork belly with fried shallots), banh mi, and other sandwiches, plus beer and wine. Look for an opening in May in the former Dogpatch Cafe space. 2295 3rd St. at 20th St.
Congrats to Mimi Hanley and David Chung, the founders of ~POWDER~, the charming and California-inspired shaved snow shop on Divisadero. They are opening a second location in early April at Mission Bay’s Spark Social SF. You will be able to get their flavors such as black sesame, horchata, Mexican chocolate, matcha green tea, strawberry, and my favorite: Vietnamese coffee. And toppings! It will be open Mon-Fri 5pm-9pm, Sat 11am-9pm, and Sun 11am-5pm. 601 Mission Bay Blvd. North at 4th St.
Don’t miss the California premiere of Ramen Heads at SF IndieFest! Photo courtesy of SF IndieFest. Some of you may remember me blathering on about how amazing the Ramen Heads film is, and great news, it’s going to be screening in the Bay Area next week (March 23rd). But that’s not all. Nope. One of the ramen masters featured in the film, Osamu Tomita (he is known as Japan’s Ramen King and has won Best Ramen of the Year from Japan’s most prestigious ramen guidebook for the fourth year in a row) of Chuka Soba Tomita in Matsudo, Chiba, is coming to the Bay Area! He’s obsessed (really, you have to see the film) and serves a rich tsukemen (dipping style) and ramen (soup noodle style) at his shop, known for its deep and complex flavor. He will be collaborating with ~RAMEN SHOP~ in Rockridge, serving his tsukemen (with California ingredients) one day and ramen the next. I know, amazing. On Friday March 23rd, he’s serving a tsukemen special lunch course (rich tonkotsu Gyokai tsukemen, dipping style). Tickets/seatings here: $45 early bird (sales end March 16th), $50 general admission. And then on Saturday March 24th, he’s serving a Tomita special ramen bowl (rich tonkotsu Gyokai ramen, soup noodle style). Tickets/seatings here: $30. This incredible collaboration is the launch event from the Air Restaurant Project Team by ANA (All Nippon Airways), a global culinary project designed to bring talented Japanese chefs to the U.S. Look for more cool events coming up this year! 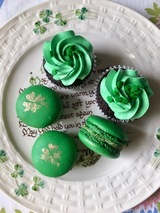 The St. Patrick’s Day cupcakes and macarons at Kahnfections. Photo: © tablehopper.com. Sure, you can track down some Shamrock Shakes (or even better, an Irish coffee at the Buena Vista) to celebrate St. Patrick’s Day, but here are some other fun options for you too. The fine folks at ~KAHNFECTIONS~ in the Mission are definitely getting into the spirit, adding Irish whiskey cupcakes to their pastry case (a riff on the whiskey-beer-and-Baileys cocktail known as the Irish Slammer), made with Guinness beer, filled with Irish whiskey ganache, and topped with Baileys buttercream ($1.75). They’ll make you like cupcakes again. There are also macarons flavored with Irish whiskey or Baileys buttercream ($2 each), a wonderful classic Irish soda bread with raisins ($6/boule and $3/individual), and Irish whiskey bread pudding ($3.50). You can get all these treats this week until everything is sold out on Saturday, and you can also swing by soon for Easter treats, like hot cross buns (starting April 1st). Open Mon-Fri 6am-3pm and Sat-Sun 8am-3pm. 3321 20th St. at Shotwell. Of course the folks at ~SALT &AMP; STRAW~ have concocted a fun ice cream flavor: their Pots of Gold & Rainbows, with whole-grain cereal bites soaked overnight in cream to capture that bottom-of-the-bowl sweet milk taste, with rainbow marshmallow “charms” stirred in to finish. You have two locations to choose from to get a scoop. The new ~CIVIC KITCHEN~ cooking school in the Mission is hosting a St. Patrick’s Day dinner with beer pairings on Saturday March 17th. Learn how to make colcannon soup and chocolate Guinness cake, and enjoy eating the fruits of your labor at the end. 5pm-8:30pm. St. Patrick’s Day is when ~HAYES STREET GRILL~ celebrates their birthday! This year, celebrate their 39th birthday over their annual meal of Niman corned beef and cabbage with winter vegetables and fresh horseradish cream, plus Hog Island oysters on the half shell, local asparagus, and Yerena strawberries. Also: they’re offering a shot of Irish whiskey (on them)! 320 Hayes St. at Franklin. And both the ~BEACH CHALET~ in San Francisco and the ~LAKE CHALET~ in Oakland will be open all day, serving corned beef sliders on a brioche bun with house-cured corned beef, pickled red cabbage, and spicy mustard ($3.50 each), and green beer. Hic. During brunch hours, a corned beef eggs Benedict on grilled light rye with sliced house-cured corned beef, poached eggs, cabbage, pepper hollandaise, and hash brown cakes ($17) will be available. A fried chicken plate from Minnie Bell’s. Instagram photo via @minnie_bells. A look at the Love Veggie pizza at Navi Kitchen (with cherry tomatoes, roast eggplant, and a combo of mozzarella and paneer). Photo via Facebook. Something is smelling really good at the Public Market Emeryville…and that would be the fried chicken from SF’s ~MINNIE BELL’S SOUL MOVEMENT~, which is opening Thursday March 15th in the La Cocina incubator kiosk formerly occupied by Nyum Bai (who went on to open a brick and mortar in Fruitvale). Fernay McPherson has been busy with pop-ups and catering, and now she gets her turn at running a (semi-)permanent spot for a year. After that, hopefully she will find her dream location in her native Fillmore in SF. East Bay Express reports she will be serving her trademark fried chicken. (“She brines her chicken in hot sauce, buttermilk, and fresh rosemary for 24 hours before dredging it in flour. 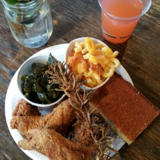 But she dredges whole stalks of rosemary, too, and drops those in the fryer alongside the chicken to help infuse the meat with even more flavor.”) The fried chicken is available by the piece or in a meal, like two pieces with cornbread and a side for $9.75. Rotating sides include mac and cheese, and collard greens. Look for some seasonal specials, weekend waffles, and dessert too. 5959 Shellmound St., Emeryville. Now open is a second location of ~STAY GOLD DELI~, in the former Sacred Wheel Cheese in Temescal. Look for their menu of barbecue sandwiches (including a smoked pork Cubano, which I want right now), deli sandwiches (like a classic Italian hoagie and a Reuben), and charcuterie and cheese boards. Beer and wine are available, and there are also some pinball machines and outdoor tables too. Open Sun-Thu 10:30am-11pm and Fri-Sat 10:30am-12am; happy hour is Mon-Fri 4pm-6pm. 4935 Shattuck Ave. at 49th St.
(Sponsored): Cheese Lovers, Get Your Tickets to Next Weekend's California Artisan Cheese Festival (March 23rd-25th)! Cheese, cheese, and more cheese… Get your tickets now before they sell out for the 12th Annual California Artisan Cheese Festival March 23rd-25th in Santa Rosa. Nosh your way through The Best Bite on Friday night, an epic walk-around tasting and friendly competition with cheesemakers, chefs, and cheese mongers paired with beer, wine, and cider. Saturday, treat yourself to insightful and delicious seminars and pairing sessions with industry experts. Then it’s a happy two hours at Cheese & Cocktails, with distilled spirits and artisan cheese sampling. Sunday wraps up the weekend with a lively multicourse Bubbles Brunch and the ever-popular Artisan Cheese Tasting & Marketplace, with more than 100 cheese, beverage, and artisan vendors! It’s a cheese lover’s DREAM. Buy tickets at artisancheesefestival.com and follow us @artisancheesefestival! 49 Square Catering is seeking a full-time catering sales manager to be a part of our busy catering and event planning team. This person should be professional, personable, hardworking, and a responsible team player. 49 Square Catering is a fast-growing, creative catering company, and there are a lot of great opportunities to grow with us. This is a full-time position, with some nights and weekends. Learn more about this job and apply by clicking here. the girl & the fig CATERS! is now hiring an event production manager. We are looking for energetic, positive individuals who enjoy working in a fast-paced environment and can provide consistent, friendly, and responsive service to create an exceptional experience for all of our guests. Successful candidates will be professional, detail-oriented, organized, and possess exceptional customer service skills and the ability to multitask efficiently. All content © 2018 tablehopper, LLC. I am more than happy if you want to link to my reviews and content elsewhere (thanks, glad you dig it), but republishing any part of them in any way, shape or form is strictly prohibited until we talk first. Please take a look at my Creative Commons license for more detail.